For those of you who are new to the brand like I am, here's a quick rundown. Lola Jeans was founded in 2006 by brothers David and Sam Abissidan in Montreal, Quebec. (Side note: Love the fact they're Canadian!) Lola tapped into their family business roots—their dad owned a denim store called Prestige Jeans—and David's interest in fashion. Today Lola offers a variety of women's jeans in classic, athleisure, and trend-driven styles, for conventional and curvy sizes. 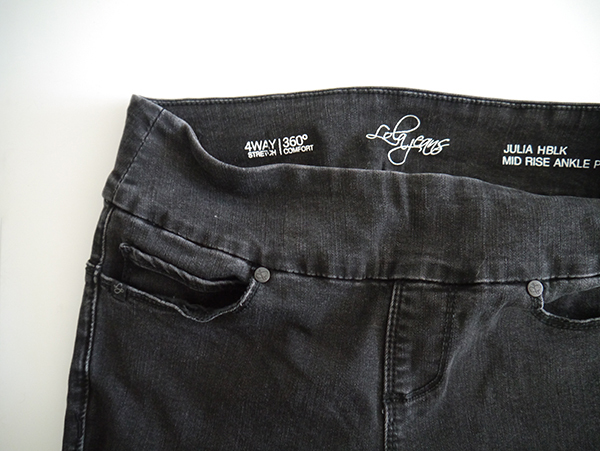 However, the Signature Pull On Jean is all their own. In their words: "The design behind the Pull On Jean is intended to encourage the acceptance and celebration of a woman's body, as it is. This fit became the basis of who we are today, setting the standards by which our customers have come to expect from us." After browsing around the website and with some advice from Lola's PR, I ultimately settled on trying the 'Julia' style. Billed as a mid-rise ankle-length style, the front of the pant had no buttons, belt loops, or zippers to create bulk or discomfort. When I pulled them on, they looked completely smooth in the front and under tees and sweaters. On my 5'3" frame, the waistband was actually more like a high-waisted fit than a mid-rise. The 28" inseam didn't require any hemming, although if it did Lola does offer that as a complimentary service. 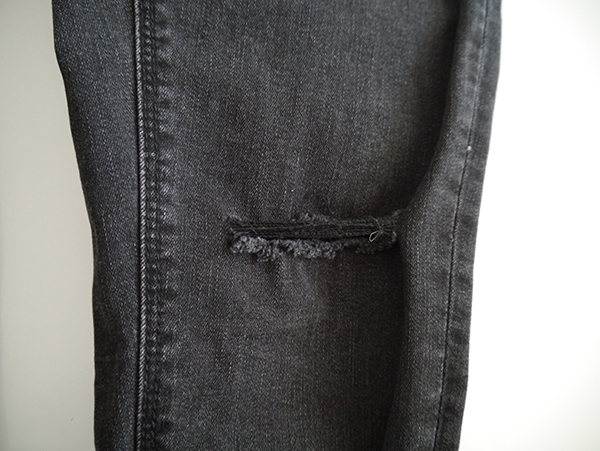 I liked the rips in the knees paired with the slightly faded black wash. Normally I'd never buy ripped jeans for myself because I prefer more classic styles that can be dressed up or down, but it seemed fun to try them just this once. 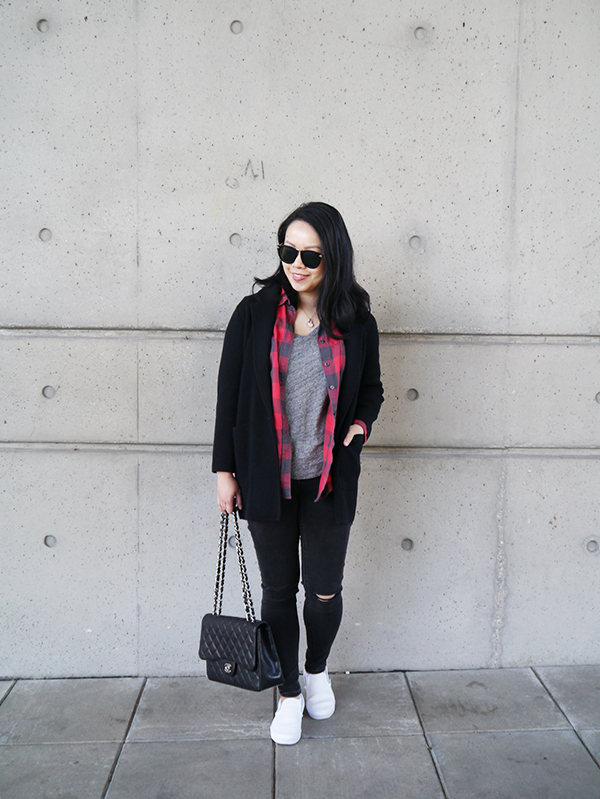 Other than the rips in the knees there was no other visible distressing, so these jeans didn't feel overly casual. Other than the yoga-pant-like wide waistband, the 'Julia' looked like any other regular pair of 5-pocket-style skinny jeans. 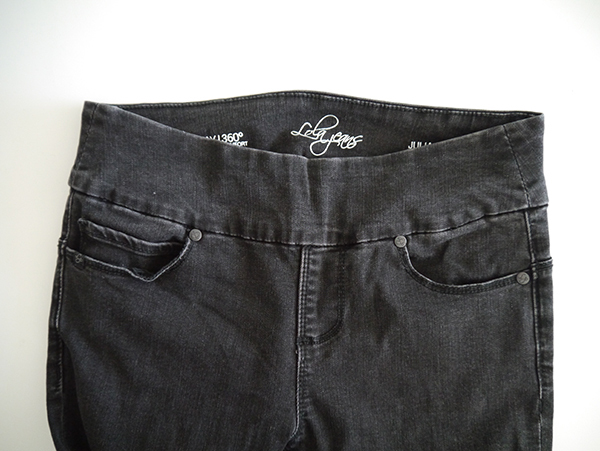 The 4-way stretch denim had a nice thickness and weight and didn't cling in a skintight way like a jegging. So far, so good. Now for the not-so-good part: The sizes run large and the denim stretches out a lot, so you'll have to size down more than you think. I wish I'd known this beforehand—the website didn't have any of this contextual info on fit and the stretchiness of the fabric, which would've been hugely helpful in ordering jeans online. I wear a 4 or a 6 at most stores and a 27 in jeans, 28 if the denim doesn't have a lot of stretch or I want a looser fit. After consulting the size guide on Lola's website and triple-checking the inch measurements, I went with a 27/size 2. The pants fit fine when I first put them on for the day. However, they loosened so much after the first hour of wear that the waist began to slide down. Excess fabric bunched at the hips while the knees and seat began to sag. I'd find myself pulling on the waist to hoist up my pants multiple times throughout the day. They stretched out so much that I couldn't wear them for 2 days in a row, whereas with my other jeans I could wear them for 2 weeks at a time and be fine. Thus far the Lola Jeans 'Julia' has only fit me perfectly for one week in December, and that was before I miscarried. In retrospect I should've gone with a 26/size 0, but even barring the sizing issue, women's bodies change throughout the month (hello, bloating) or with variations in diet, exercise, etc. It's just a fact of life. I hated that these jeans had to fit 100% perfectly for me to be able to wear them because I didn't even have the option of belting them. A hidden drawstring on the interior of the waistband (like workout leggings have) would've been nice. And speaking of belts, trying a pull-on legging style jean made me realize how much I missed the versatility of a classic jean. 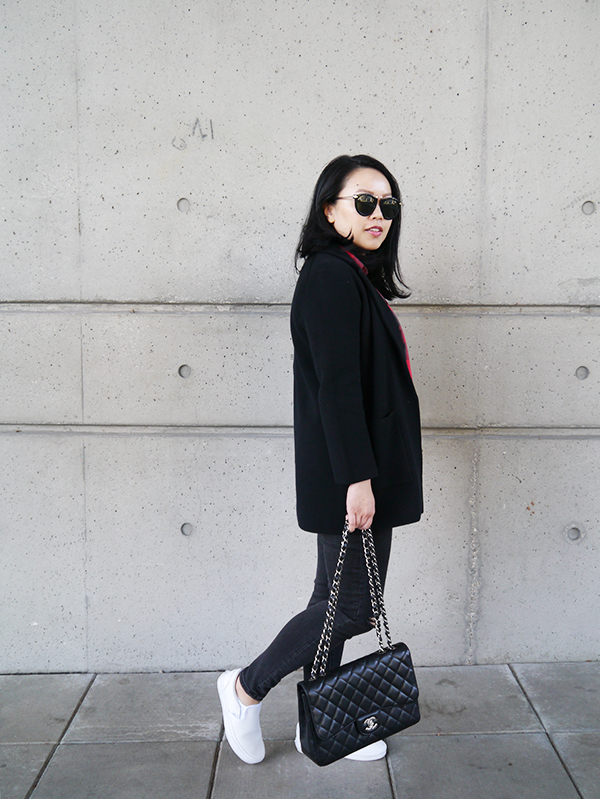 With my other pairs, I could belt them and do a half-tuck with my tees on days when I was feeling more svelte, or I could leave my tops untucked and loose over the waist if I was feeling a little more bloated. Final takeaway? The Lola Jeans pull-on jeans are a solid option at an affordable price, especially if the concept of a legging-style jean appeals to your comfort-loving ways and you want to try something different. Just size down. Whoaaa!!! Those look so comfy. I haven't worn a pair of jeans in like 3 years, but those look so comfy that I might have to consider getting a pair. They are comfy for sure! I'm bummed about the fit issues, but I'm still hanging onto these for the future as my "first awkward stage of pregnancy when I'm just feeling fat" pants.